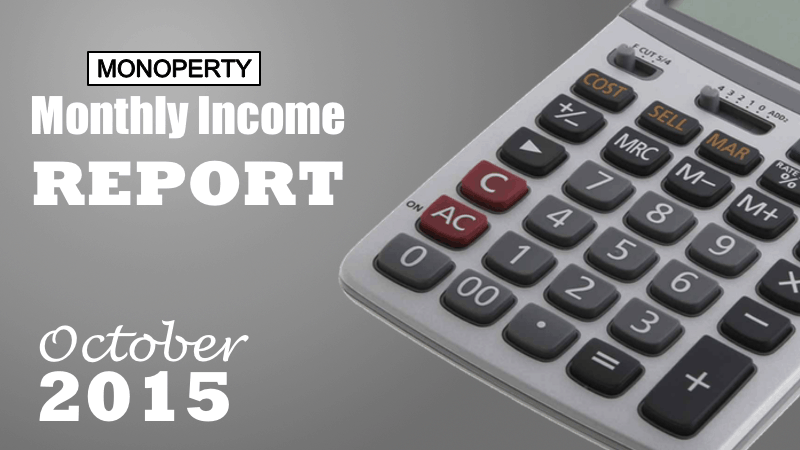 Welcome to my monthly income report for October 2015! Every month I will summarise the activities which took place that had a direct effect on my income. My hope is that you can learn from things that worked out well, and those that didn’t. Firstly, I would like to update you on my learning from September 2015. They explained that the deposit charge was for the Tenancy Deposit Scheme (TDS) which is an annual charge they incur which they must pass on to the landlord. I fully understood this and explained that it should be included in the cost of their set up fees as it’s compulsory, and not added afterwards. They explained that their set up fee of £195.00 + VAT covers costs for marketing the property on the varies portals (RightMove, Zoopla etc), conducting viewings, time, paperwork and inventory. Without boring you for to long, the agent stated that as a gesture of goodwill, they will include the inventory fee as part of my set up fees for future tenants. I requested a refund of my previous inventory fees, but they refused to issue one. Will I take this further and write to their head office? I’m not sure yet, I’m a busy guy! But I will put this down as a learning and I will not make this mistake again. I will insist on receiving all fees in writing before agreeing to any contract in the future. The amount isn’t earth shattering, but it’s the principle. I do not like people or businesses that do not disclose all information at the out set. Over the last couple of years I have made an effort to shop harder and use comparison sites for my personal, and business, utility providers and insurance. Last month I saw an increase to my Sky subscriptions for Property 1. I was previously paying £29.75 per month and it jumped to £41.00 in September 2015. After a brief chat with Sky on the telephone, I committed to another 12 month contract at the reduced price of £24.00 per month with the first month only being £17.94 (not sure why), which you will see on my balance sheet below. You have to telephone the cancellation department to be offered a deal, but it is worth your time as Sky are highly rated for rewarding and retaining their customers. I have made a note in my diary to contact them next year before the price increases. On Tuesday 20th October 2015, I attended a Planning Committee Meeting held in Liverpool Town Hall. I was advised to attend by my case officer who was overseeing my application of a change of use from Residential to a House of Multiple Occupancy (HMO) for my 2nd Renovation Project. My application was successful and you can read my full blog post here. I wanted to briefly mention this, as it will have a positive effect on my future income reports. It is good news for me and working professionals in Liverpool! Property 2 is still being funded by Property 1, which is not ideal. I had initially hoped that my overheads would be covered from the rent of 4 tenants. My council tax will reduce next year as I have had to pay double the amount for 2015/16 as the property was standing empty for over a year when I purchased it. I did not foresee this and I did not achieve my target of £80pppw. Both these factors have had a negative effect on my balance sheet. Every investment property you purchase should fund itself and provide a positive cashflow. If it doesn’t, for whatever reason, you should implement your exit strategy. I have a mid to long term approach with Property 2 though. The approval of my planning permission has hit my mid term goal. It was risky, but it was a calculated risk based on the knowledge I had gleaned from the local area. This means I can now rent out the remaining 5 double bedrooms which will result in a positive net cashflow. The question now is – How long will it take to find another 5 tenants? I hope you found this useful. Please leave a comment below if you have any questions, recommendations or advice about my October 2015 income report.